Once you wake up Carth briefs you on your new mission. Note that in this first conversation with Carth there are no choices that affect your alignment no matter how evil you try to be. Proceed to loot the container here and upgrade your prototype vibroblade with the vibration cell you got. You can remove the upgrade later if you wish and use it on another weapon, so there is no reason to wait. Once that is finished exit the room and face your first battle on Taris. If you are having problems with this battle you may want to use the ion blaster against the battle droids or chuck a frag grenade, but that should not be necessary. Go ahead and search the other apartments here, as there is no impact on your alignment. There are 3 bags and 1 footlocker here with random equipment. Other things to do here: Begin Dia's Quest here and talk to Carth about his past. Talking to him can eventually lead to a side quest and a possible romance if you are female so keep it in mind. All of your comrades have side quests involving their background so remember to talk to your comrades every once in a while (all except T3-M4 and Zaalbar). See Comrade side quests for more information. Finally Go South to exit this apartment complex. The next goal you have is to gain access to the lower city. To do this you need to pass the Sith guard at the elevator in the North section of the Upper City. He tells you that you need either authorization papers OR you must be on a Sith Patrol. Since you have no way to get the authorization papers, we have no option but to impersonate one of the Sith. To do this you need some Sith uniforms. There is the easy, neutral way, or there is a second more "difficult" way that can net you light side points depending on your actions. The first way is to go to the Cantina and talk to either Sarna (if you are male) or Yun (if you are female) and be nice to them to get them to invite you to a Sith party. You do not need to persuade either of them, there are alternative conversation choices that give the exact same response so don't worry if you don't have any points in persuade yet. Now go to the City North and enter the apartments. Go clockwise and the first open room should have the party going on in full swing. Enter, and loot the room for 300 XP and some Sith Armor once the Sith officers are plastered. You are now able to move freely between the Lower city and the Upper city. To be able to do the second way you must NOT get invited to the party. In fact if would safest if you were to not even talk to Sarna or Yun. Just go to the same apartment complex where the party was supposed to be held and the room beyond where the party is supposed to be you will see a Hidden Bek spy being interrogated by a Sith officer. LIGHT: Stop the interrogation and a battle will ensue. NONE: Let them kill the prisoner. Afterwards just enter the room, and a battle will ensue. MIXED: Stop the interrogation (Light side points), but be sure to kill all of the Sith soldiers outside of the room. Get the armor and wear it before talking to the alien that was being interrogated. Then proceed to kill him (Dark side points). Loot the bodies here for the Sith armor and 300 XP. With those encounters out of the way equip the Sith armor and continue on down to the Lower city. Make sure you talk to the elevator guard with the Sith armor on for 350 XP. Use the elevator for another 50 XP and once down in the Lower city re-equip your best armor and move forward for a cut-scene and a short battle. This is where the battles actually begin to have some challenge. The entire lower city is full of encounters and if you don't stop and heal in between you can find yourself dying. Your next goal is to gain access to the Undercity and find out more about where Bastila is. This is far easier than gaining access to the Lower city. First make your way to Javyar's Cantina. Note that here you can continue Dia's quest by talking to Holdan, help Lyn Sekla the dancer, and get bounties and information from Zax. Anyways, once you enter the center of the Cantina you will see a short cut-scene with Calo Nord. You can talk to him, but if he reaches three then you WILL die. He has a special blaster that is an instant kill no matter how high your vitality. Let him be, and go forward, look at the cut-scene with Mission Vao. Talk to her afterwards for 60 XP. Leave the Cantina once you're finished here and go to the Hidden Bek's Base. Talk to the guard to let you in. Don't try to bribe her as it never works. Talk to Gadon, and give him your uniforms in exchange for security papers. Once that is done you now have access to the Undercity. Before you head down you may wish to explore the east and west apartments for better gear and some XP. The extra gear will come in very handy down in the Undercity. Regardless once you are ready head over to the elevator to the Undercity. Our mission here in the Undercity is simple, find Mission and get into the Black Vulkar Base. You need the prototype accelerator to be able to enter the swoop race and save Bastila. Now the first thing that happens once you enter the Undercity is that you are accosted by a couple of beggars. You can gain light side points by giving them 20 credits, but nothing else. Go northeast towards the exit of the village, where Igear will try to sell you something. His items are cheap so you may wish to stock up. The Arkanian blaster is especially good this early in the game. Next when you reach the village gate you will see Hendar being chased by a Rakghoul. You can save Hendar without gaining light side points if you wish. It's actually easier to kill it with Hendar there since he ends up being a target of the Rakghoul so I suggest you help him out especially since this beastie is a bit tougher than his more common brethren. If you want the light side points make sure you talk to Hester and not Hendar after you save him, as only Hester's dialog grants light side points. If you don't want the points you can either just let him die before finishing off the Rakghoul, or talk to Hendar and not Hester after finishing off the Rakghoul. In any case once you exit the village you will be attacked by that Rakghoul and you get a bonus of 100 XP when you kill it. Remember the Undercity is crawling with groups of Rakghouls that respawn and is a good place to gain experience. Frag grenades come in real handy here as you can take out large packs of them with minimal fuss. Anyways go forward and lo and behold Mission comes running to you for assistance. Agree to help her (you really don't have a choice) and she joins your party for 330 XP. Level her up and re-equip her with better items. To the East of you is a Sith patrol. You don't have to fight them if you want but it is better if you do for the XP and the loot they drop. There are two entrances to the sewers but the North one is closer to Zaalbar so I suggest you go that route. Once in the sewers watch for mines. Before entering the Gamorrean Compound you may want to activate the rusted droid in the room across the hall to make the battle easier. There will be three elite Gamorreans and a Gamorrean chief. This battle can be tough, especially if you don't have a dedicated tank. You may wish to lob a grenade or two to help you win the battle. If you are really having difficulty, one method that I have found to make the battle much easier is to station two of your characters with blasters in the room with the spiderbot, or down the corridor nearer the entrance. Take the strongest character, give him a melee weapon (which would be Carth if your main character is weak) and have him open the door. One or two of the Gammoreans will charge after you, at which point have him run to where your companions are. Your other two characters will be able to flank the Gammoreans, and Mission will get extra Sneak Attack Damage if all goes well. Usually you can lure them so that they come at you in a line, one or two Gammoreans at a time, making the battle significantly easier. Another method is use Mission to set several of the frag mines that you've picked up on this level. Just open the door, run forward, and run back to get them to follow you. If you're lucky you can take out up to three of them without even lifting a finger making this battle that much easier. After taking them out go to the locked door and you will see a cut-scene where Zalbaar will join you for 630 XP. You may want to go to the next room to loot the weapon's locker for a scope, Zalbaar's bowcaster and some grenades. If you want you can clear this entire sewer level, and get all of the journals now for the Promised Land Side Quest. Next head back to the north entrance and go east. Unlock the force field and proceed to the Upper Sewers. Continue onwards, killing the Rakghouls and Gamorreans as you go until you get to the room with the Rankor in it. Be sure to save first before proceeding as it is easy to die here. You have several ways of dealing with the beast. The easiest method involves just placing the synthesized odor in the corpse pile along with one grenade of any type. Mines do not work here. You gain a mere 200 XP for this. The odor is found on the disembodied arm with the datapad right before this room. This second method requires that you have around 8 or 9 minor frag mines. Use stealth to sneak up to it and plant 9 mines in a row. Uncloak, and let it run towards you. It should die before getting to you. You get approximately 750 XP for killing the Rankor (give or take depending on your level). A third method involves lobbing 6 or 7 frag grenades at it (5 if you're really really lucky). You can lob a grenade and then run back to the safety of the corridor, or you can sneak past it to the walkway where it cannot target you and just lob from there without having to retreat. This way is cheaper than using mines. Again you net approximately 750 XP for killing it. The cheapest method is just to sneak past the Rankor. If your main character has the stealth skill that is easily done, just make sure no-one else is in your party when you attempt to do so. If your main character doesn't have the stealth skill it is still possible. Again make sure you only have Mission and your main character in your party. Then you must sneak past it as Mission, and then uncloak. 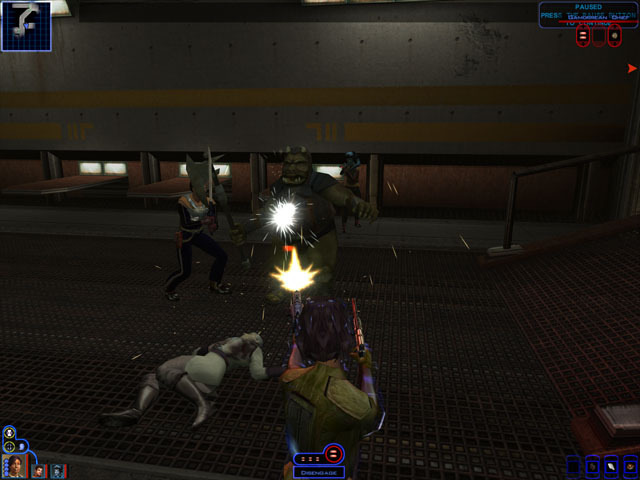 Attack it with a blaster as Mission to keep its attention focused on you and then run past it with your main character. This method nets you no experience. Another way is to simply outrun the beast when it charges you, though that is quite risky (it is possible). Use an alacrity stim to increase speed if it keeps killing you. If you don't kill it now you can return later and kill it if you wish. The Rankor is vulnerable to the choke line of force powers (via Bastila). Disruptors also work well, though it will take a long time to kill it, as it has such a high AC. You get a rifle inside the Vulkar Base and a pistol if you kill Kandon. Usually I try to kill the Rancor as soon as I get the Disruptor Rifle as you gain more experience the lower your level is. You may wish to use Carth to fire the Disruptor Rifle if your main character is not a high dexterity soldier. While it is possible to attack it with a sword and do damage, the Rankor has an attack bonus of 37, and has an instant kill attack DC 100, meaning that any attacks it does will hit and will kill you so melee is obviously not an option unless you cheat. Once past the Rankor, kill the guards near the back entrance. Once you enter you cannot modify your party or transit back, so if you have things you wish to do before entering, do so now. Mission can by handy to have at this early stage in the game, but if you want the brute force approach choose Carth and Zalbaar instead. If your main character is a scoundrel then definitely choose Zaalbar over Mission. When ready enter the base with the party you want. Our goal is to get to the Garage Level of the Black Vulkar Base, and to steal back the prototype accelerator OR to join with the Black Vulkars and kill Gadon Thek. But before we can kill Gadon we must first get to the prototype accelerator. On this level we need to bypass the Garage Security. If you try to use the elevator without disabling the turrets, it means instant death. There are two ways of doing this. One is by hacking the main computer panel and the other is by getting the passcard by killing the lieutenants. 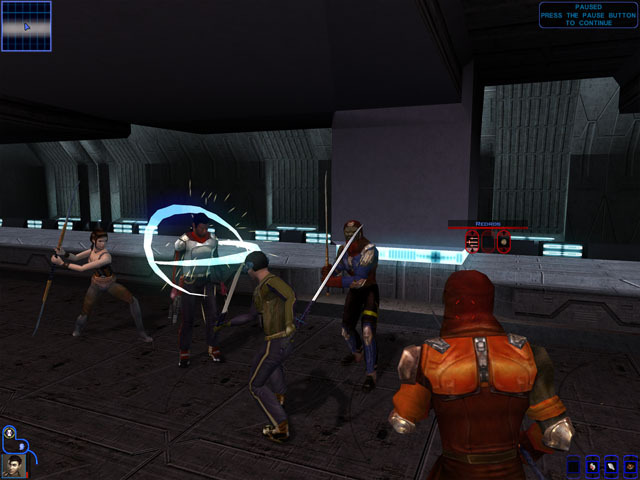 The lieutenants are surrounded by allies so it is easier to kill them by slicing into the computer and overloading the circuits in the barracks. If you do decide to take them on by brute force I would suggest you use grenades as this can significantly ease the battle. Note that the room across the hall from the barracks has a footlocker with very good equipment, but it is surrounded by 3 deadly gas mines. The easiest way of getting around that is just by having one of your characters run in, trigger the mines and using an antidote afterwards. You can program the robot but that will cost you repair parts which are expensive and doesn't net you any experience. Also you can free or kill the waitress in the dining room for some light or dark sided points respectively. If Carth is with you, you won't be able to kill her, but you'll still get the dark side points. In the Control Room is also a gang member that pleads for his life that you can kill for dark side points, though letting him go doesn't net you any light side points. Once you are ready, make your way to the elevator and bypass the security. This garage level also has some tricks you can take advantage of. Go down the hall to the west and take out the Garage Head and his lackeys. Then go to the office where you can access the computer. Once there you can slice the computer to make one of the swoop bikes in the garage overload. When you do so four Black Vulkars will come running in and die in the subsequent explosion. Get the Garage Head Key Card in the desk while you are there. Next to the south. Watch for mines there as well. There is a workbench to the southwest where you can upgrade your arms and armor in preparation for the upcoming fight. Before going through the security doors you may wish to go to the loading dock. This area is accessed by fixing the Junkpile droid that isn't a spiderbot. Program it to ram the doors and the doors to the Loading dock will be opened and where you must fight a Vulkar patrol droid. It has a carbonite projector making this battle rather difficult, but still quite possible as long as you have all three members of your party fighting. The Echani fiber armor comes in rather handy against him. After the fight loot the footlockers for a whopping 2000 credits and some other nice goodies. Make sure you keep those 2000 Credits because you'll need them later on. With that out of the way, Go through the security door for a conversation and a major choice: accept their offer and betray Gadon or reject the offer and fight. There are pros and cons to both sides. While you cannot gain any light side points by sticking by Gadon, you will gain some dark side points if you betray him. There are a few items that cannot be gained in any other way than to kill Gadon, but they become outdated rather quickly anyways so that is no reason to betray him. It's just a matter of personal preference so choose whichever you will. This conversation ends in battle. Loot the bodies and collect your reward, the Swoop Accelerator. Go back to the Hidden Bek base, this time out the front doors. Talk to Gadon and you'll be taken to the swoop races. An easier alternative is to accept Kandon's offer, and then double cross him by going back into the base and taking the accelerator, this time without Kandon present. While this does make the battle easier it does deprive you of his equipment and XP for killing him, and also gives you dark side points which you most likely want to avoid this route, so I wouldn't recommend it. You will automatically be escorted out of the base. Go back over to the Hidden Bek's base and enter. They won't attack on sight but as soon as you open any security door the entire base will go hostile. Clear the place out and loot the bodies, especially Zaedra's. You might want to explore this base fully before going down the elevator. Also before killing Gadon you may want to go back into the Vulkar Base and kill Kandon's Bodyguards for some XP and some equipment. In fact you can even pick up the Prototype if you wish. Doing so will not prevent you from working for the Vulkars. Now Heal up and prepare before going to Gadon's private quarters because you're in for a big fight. Both Gadon and Keira are melee fighters and deal good damage so energy shields are useless and you'll want to stick with melee weapons. Mission is useless in this fight so you'll probably want to go with Carth and Zalbaar. Once he is dead loot the bodies for some good equipment and go back to the Vulkar base for 500 credits and a chance to win the swoop race. After the second win you'll gain 330 XP and Brejik will refuse to award Bastila to you and a battle will ensue. Poisoning Brejik or using a concussion grenade will make the battle easier. If you are still having trouble just keep running away and let Bastila handle everyone as she is invulnerable at this point. Make sure you loot the bodies, especially Brejik before talking to Bastila, as you will never be able to return to this location ever again. Talk to Bastila to return to you Hideout. Soldiers: Easy. Their great combat abilities and and good equipment allowed them to mow through the opposition without to much difficulty. Even saving a few levels didn't affect dificulty at all. Strength based melee soldiers may have an easier time, as melee damage isn't affected by energy shields, and they don't have a disadvantage against other melee fighters such as the numerous rakghouls. Combat Scouts: Medium Easy. While they may be the least easy of the 3 classes when built for combat, as long as the scout is built well things shouldn't get too hairy. Scouts (Wisdom): Medium to Very Hard Difficulty. It depends on the levels saved. As these guys were both designed to ultimately become consulars their high wisdom was of little use at his point. If you level up your scout to around level 5, as long as Carth is in the lead for the first portion it is not too difficult, just remember to heal. Once Zaalbar joins the party things become considerably easier. However if you want to keep your main character at level 2 to save levels for later, then it can become quite difficult. Even with Carth in the lead, the scout is very weak and dies easily, and once Carth is alone he gets overwhelmed, at least for the duration of the Lower City. Strategy and tactics are more important, and healing often is a must. Don't be afraid to run away when both are low on health. Ambushes work well, and the Cantina Bouncer and The Hidden Bek Guard will help battle against the Vulkars, so use that to your advantage. Unlike scoundrels, a level 2 scout has nothing beneficial to offer at this point, so Carth is going to be doing most of the fighting. Once you get Mission things get slightly easier, but Zaalbar really eases the burden of fighting. Once you have him difficulty changes to medium. Combat Scoundrels: Very Easy to Easy. The melee scoundrel was the easiest of all the builds by far. A good tactic that I use is as follows: equip him with two melee weapons, put him in stealth mode, have him flank while Carth attracts their attention, and use flurry, whereupon most enemies die in a round. Even with groups of enemies they go down quickly because of his high Strength. Perhaps the easiest of all the builds, except when soloing. The dual blaster wielder was also quite easy as well. Her lower strength makes it not as easy as the melee build, but still easy enough. Use the same tactics as above but use ranged weapons instead of melee. Make sure she isn't targeted by enemies as melee attacks have a large bonus against those that use ranged attacks. Scoundrel (Wisdom): Medium Hard. While she does get sneak attack damage, I didn't invest in the stealth skill, nor is her dexterity as high as the combat scoundrels, making her a less proficient fighter. While he is not bad as the level 2 scout, she still isn't designed as well for fighting as the other scoundrels, making it a bit more difficult, at least early on. While flanking may seem like a good idea, in her case as she is staying a level 5 she is more fragile with only 25 VP. Mainly to protect her I don't have her flank. If there is a clear opportunity to do so I will, but usually she just stays in the background. Overall: Medium. It really depends on how many levels you are saving. The fewer the levels the easier it is, as well as if you are shooting to become a consular or not. Those that are combat oriented are going to find Taris much easier than those that are ultimately going to become Consulars. That said, once you have Zaalbar most characters should be able to finish this half of Taris without too much difficulty.